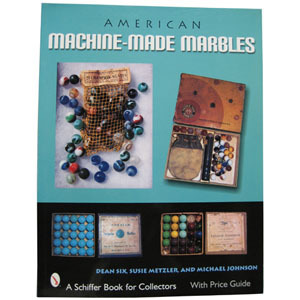 MoonMarble.com - "American Machine-Made Marbles"
Marble Collecting Books and Accessories → "American Machine-Made Marbles"
The sprawling scope of machine-made marble production in the twentieth century is illustrated in over 590 eye-catching color images that comprise the most extensive collection of marble packaging ever assembled. Historical photos from a variety of factories are also provided. Products and packages for Akro Agate, Christiansen Agate, Davis Marble, Heaton Agate, Kokomo Opalescent, Libbey-Owens-Ford, Marble King, Peltier, Ravenswood, and Vitro are included among others. The fascinating text, providing a history of the marble companies and their wares, was nearly 40 years in the making, involving interviews with over 100 individuals and insuring the accuracy of the listings. A bibliography and indez are included, along with values in the captions. Marble collectors and glass lovers alike will be thrilled with this detailed reference work.